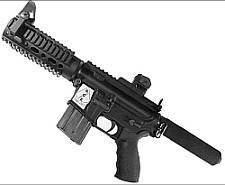 Uses a carbine buffer and spring for the ultimate in reliability. The overall length is only 7” from the back edge of the receiver. Includes: 1.25” ambi sling mount, billet machined gusset (to retain detent and keep extension from unscrewing), special short receiver extension tube, foam overtube (you cut to length), CAR buffer and spring.